Sailing enthusiasts Niels and Keld Hansen came up with the concept behind Wavestar in 2000, but the idea originated when they were sailing near their parents’ summer house. They began to talk about how they could harness the powerful forces beneath them. 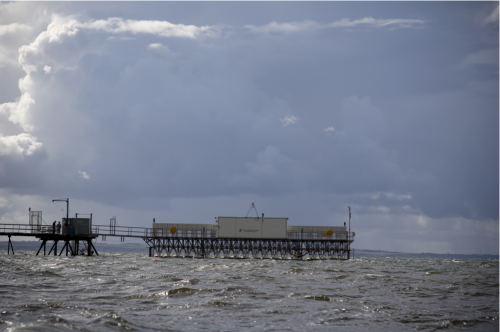 The company purchased the rights to the machine in 2003 after seeing the huge commercial potential of wave energy. The Hansen Brothers remain as consultants at Wave Star while the Clausen brothers, the family behind Danfoss, are now the main shareholder. In 2004 extensive tank testing was performed on a scale 1:40 model with the sole purpose of optimising the basic configuration of the system and to document the electrical power production in typical North Sea waves. More than 1,300 different test runs were performed to optimise the concept and were used to document any technical questions about the concept as they arose from the testing. 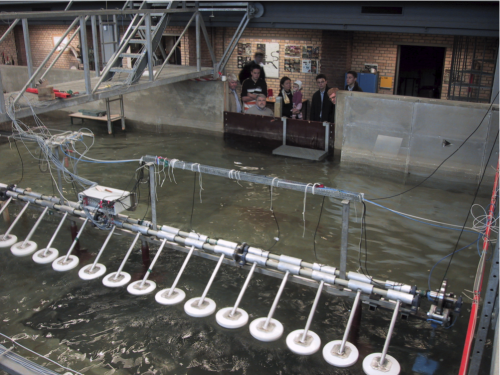 Early scale 1:40 Wave Star Energy test model in the wave test tank at Aalborg University in 2004. In 2005 the first grid connected scale 1:10 model was designed and built for operation in the sea at Nissum Bredning where the waves are approx. 1:10 of North Sea waves. It was designed as if it was a big scale machine in order to learn about the practical issues of operation in the sea. The system contained all the instrumentation and control systems necessary to work unattended round the clock. After the final dry testing, the scale 1:10 model was installed on 6 April 2006 and put into round the clock operation on 24 July 2006. Since then it has logged more than 15,000 operational hours in the sea and been through 15 storms without any damage. By international standards, it is quite an achievement because nobody has test systems in the sea which just work, without major technical problems. The test section of the 600 kW machine has been installed at Hanstholm the 18 September 2009, the installation was performed in two days. A bridge was built to access the machine in autumn 2009 and the first guest could visit the plan during the COP15. The machine has been connected to the grid since February 2010. 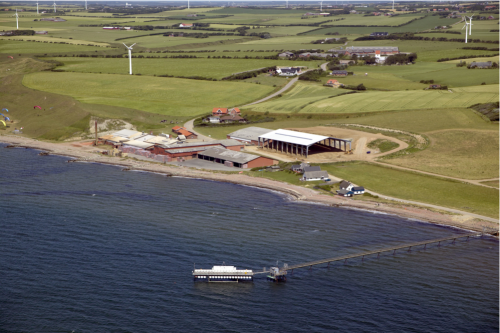 Wave Star receives a payment from EnergiNet.dk every time the production is above the green curve. The green curve has been agreed with energiNet.dk based on estimated production figures from the beginning of the test. The reports contains both wave information (wave height, period,..) and also information on wind (speed, direction…). 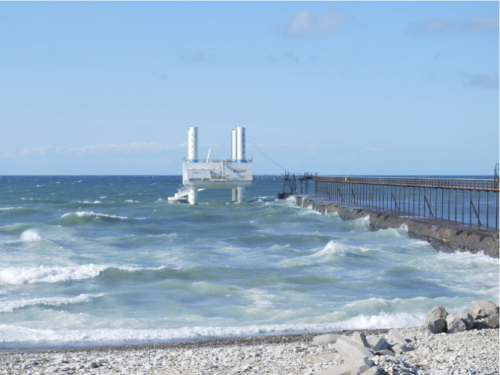 EnergiNet.dk is studying the data to show a correlation between wind and wave. A report on that analyze should be available soon this year. The machine should be adaptable according to the sea condition and to the most efficient cost of energy. The scalability of the machine (floats from 5 to 10m in diameter) makes it very adjustable to sea condition.